‘This program has the potential to transform lives,’ Christine added. 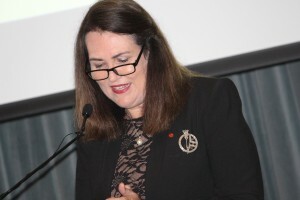 Special guest Senator Deborah O’Neill, Shadow Assistant Minister for Innovation and Shadow Assistant Minister for Mental Health, said the mentoring program would ‘enable Catholic women to have a wider role in the Church and society’. Quoting Saint Mary MacKillop, the Senator said, ‘never see a need without doing something about it. We can see a need and we have a responsibility and a chance to do something about it. 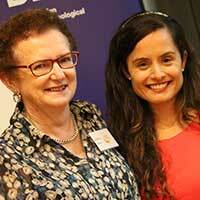 Dr Gerard Goldman, CEO of Broken Bay Institute encouraged those gathered to ‘develop a listening heart’. 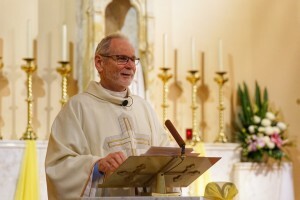 Earlier in the evening, Fr Greg Bourke celebrated Mass at the Mary MacKillop Memorial Chapel. Fr Bourke was representing the Bishops Commission for Church Ministry as Executive Secretary. 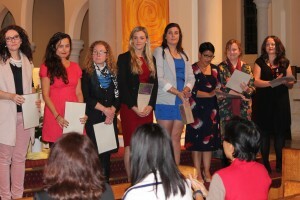 Marking the conclusion and graduation of the two-year Young Catholic Women’s Interfaith Fellowship organised by Andrea Dean at the Office for the Participation of Women, Fr Bourke encouraged the graduates to ‘go out and scatter like seeds and be Christ every where you go’. He acknowledged the women who travelled from Brisbane, Sale, Perth, Canberra and many more places to participate in the Fellowship completing study, formation, interfaith dialogue and hard work. ‘You are now ready to be scattered like the seeds of God’.